We know that horses and riders are all, more or less, asymmetrical: more supple to the right, stiffer to the left for example. It is important to be aware of it as it can affect the correct execution of a movement such as the accuracy of the track. 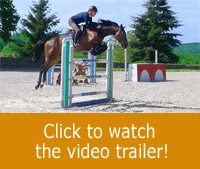 The rider has to aim for a symmetric position and some symmetric aids to avoid confusing and misusing the horse. This is what Michel’s new exercise is intended for. The set-up is extremely easy but it proves to be very effective to challenge the rider’s ability to keep his horse on a precise track. The goal is to direct the horse with almost no hand aid, but simply with the position and a few discrete leg influence. To successfully execute this exercise, the rider has to be able to plan ahead each phase of this exercise. In this first part of the exercise, Michel starts at a walk and a trot. The canter work will be in a follow-up video. This same work at a canter requires the horse and rider to master perfectly the exercise at the lower gaits. Michel emphasizes on the requirement necessary for the rider to stay present mentally and physically at all times. 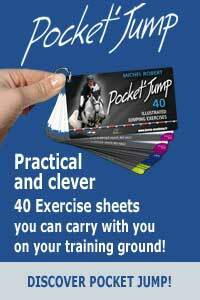 He explains how the rider should use his leg aid to obtain the best result with a minimum of influence on the horse. The rider will be able to put the advice into action in any situation and it will allow him to direct his horse with lightness. This exercise is also a good suppleness exercise for the horse who will have to work his left side as much as his right side to stay on the track chosen by the rider.